The armrests, seat, and footrest fold away, leaving ample walking space on the stairs. 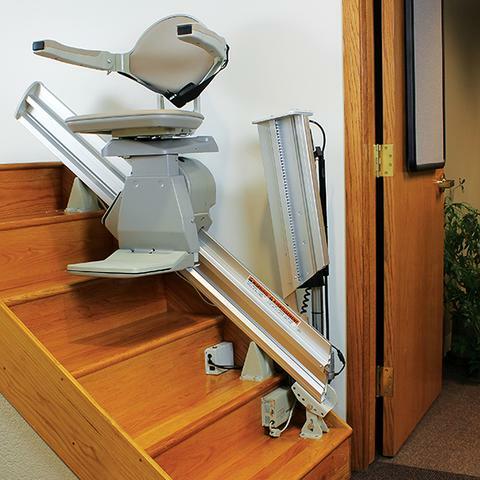 The stairlift can be installed on either side of the stairs. The chair travels on a slim rail which has been cleverly designed to hide the mechanical components and therefore can be installed to within 5-inches from the wall offering the customer a clean and compact stairlift solution. Our customers’ comfort and safety is paramount to us and as a result we choose only the best stairlifts on the market. The Elan stairlift comes with a host of comfort & safety features as standard, including a spacious padded seat with adjustable height, a seat-belt with buckle, safety sensors, soft-stop/soft-start, plus much more, offering complete peace of mind when using the lift. The stairlift features a swivel seat, making it easier and safer to exit the stairlift when you have reached the top of the stairs. The stairlift is powered by two 12-volt batteries which last a very long time, provided they are charged regularly. As a consequence, the stairlift will continue to work even in the event of an electrical power failure. The batteries will be charged when the lift is in a parked position by a battery charger, plugged into a standard wall socket. The cost of charging the stairlift is minimal. We recommend you keep your stairlift parked in the docking point as often as possible to ensure that the batteries are always charged. The Elan stairlift can be supplied with extra features, some of which may be recommended by your Occupational Therapist. If there is a door at the bottom of the stairs, we can install the Elan stairlift with a powered folding hinge rail which automatically folds away, allowing clearance at the bottom of the stairs. *Please note that optional extras do not come as standard and may cost extra. We can advise of the extra cost when we carry out our free on-site survey. The Elan stairlift is an attractive, reliable stairlift which has been built to last. It will provide you with years of dependable performance. All of our new stairlifts come with a two year warranty as standard. Furthermore, we offer a range of affordable service plans once the warranty period expires for your continued peace of mind. BM Stairlifts was founded in 2006. Our company director, Brian Cooper, has been working in the stairlift industry for over 20 years. Our engineers and electricians have installed thousands of stairlifts across Ireland and aim to make the process as straightforward and hassle-free as possible. Our company is fully insured, C2 registered with Revenue and approved by Local Authorities. A large percentage of our sales come from customer referrals which are a testament to the excellent customer care we provide. Visit our Customer Testimonials page to read a selection of reviews from just some of our happy customers.